Before the Kansas City Chiefs take another stab at postseason success, they will take a sneak peek into their future. On Wednesday, Chiefs head coach Andy Reid announced that Pat Mahomes will start the team’s Week 17 game against the Denver Broncos. 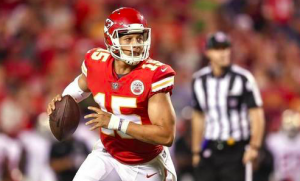 It will be the first career start for Mahomes, who was selected 10th overall in this year’s draft and could potentially be Kansas City’s quarterback of the future. At 9-6, the Chiefs have already clinched the AFC West division title. They are also locked into the no. 4 seed in the AFC playoffs regardless of what happens in Week 17. With nothing on the line but pride against their longtime rivals, Reid has decided to sit starter Alex Smith in favor of Mahomes. Smith doesn’t appear to be in danger of being benched, especially since the Chiefs have broken out of their midseason funk and won three games in a row. Instead, Reid views a meaningless game as a good opportunity to get Mahomes some experience. Mahomes has been the backup to Smith all season but is yet to play even one snap under center. Despite a lack of playing time this season, Mahomes says that he’s become a better player while serving in a backup role. Sunday will mark the first start for Mahomes since last November when he led Texas Tech against Baylor in his final collegiate game. Mahomes threw for over 500 yards and six touchdowns in that game. He’s not expecting to put up those numbers against a strong Broncos defense on Sunday. But he is expecting to lead the Chiefs to their 10th win of the season. Many believe that Reid is quite high on Mahomes and his future in the league. After all, the Chiefs traded up in the 1st round to draft him. Of course, Reid also declined to bench Smith in favor of Mahomes when the Chiefs lost six of seven games in the middle of the season. Nevertheless, there’s been some speculation that the Chiefs will look to part ways with Smith this offseason and hand the offense over to Mahomes. There’s no guarantee that ends up happening. But if Mahomes play well, it could make the Chiefs a little more comfortable in moving on from Smith this summer. Either way, this week’s game could give the Chiefs and their fans a glimpse into a future with Mahomes at quarterback.